Day 7 of the Albequerque Intentional Balloon Fiesta was a good day for fun special shapes but competition was cancelled. The morning saw light winds and the forecast called for light and veritable conditions. 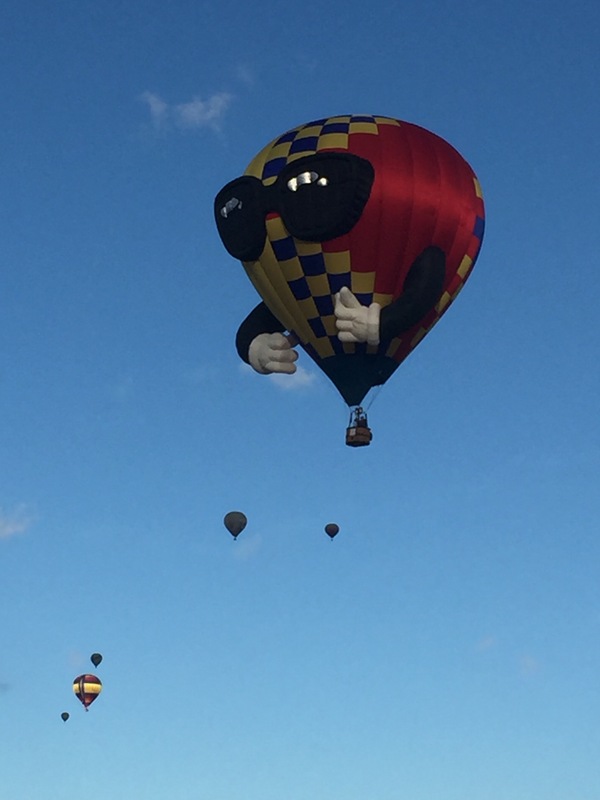 The special shapes inflated and launched to the south. Upper winds included a quick layer to the south but slower and veritable at altitude. Most of the balloon floated south for about 30 minutes and then the winds became light and in all directions. Many balloon backed up and some even went in circles. By about 8:30 competition was cancelled and the special shape and fiesta flyers made their way to landing spots all over northern Albequerque. The evening saw a breezy Glodeo and big crowds. The evening was topped off with a great fireworks show. Today was the seventh day of fiesta and the seventh day of flying. Only in Albequerque can the weather be so good for balloons. See our pics on Facebook. Saturday Day 8 of AIBF.